Drain scallops; rinse in cold water. Refrigerate. In medium bowl, place grapefruit segments. Squeeze 1/4 cup juice from remaining grapefruit, and add to bowl. Stir in mango, lime juice, red onion, chiles, salt and pepper. Add scallops; stir to blend. Cover; refrigerate at least 2 hours but no longer than 4 hours. Just before serving, stir in cilantro. Serve in clear bowls, topped with diced avocado. Looking for a flavorful appetizer? 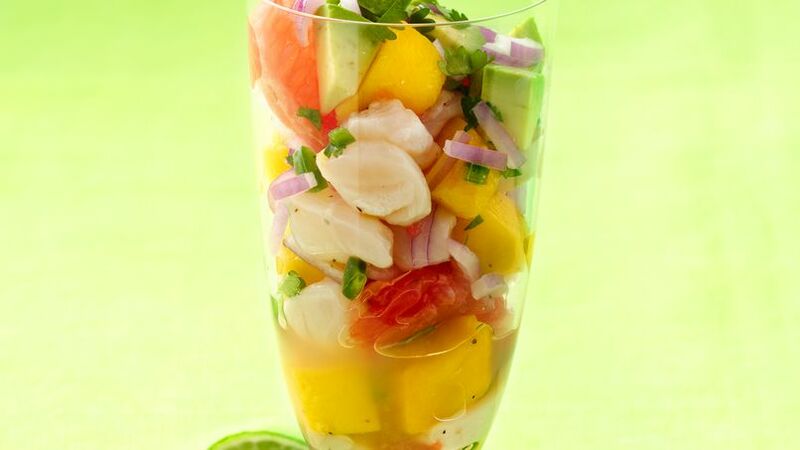 Then check out this ceviche packed with bay scallops and fruits.